Since i don't have my Pre amp right now, i bought this little USB DAC/Preamp from Best Buy $150. I'm quite impressed running it from my Laptop into my main system. The sound is clean and clear. Not enough gain to drive my Soundlabs to much over 85db's but i'm still in the game! best $150 I've ever spent on this hobby. Cool, Miko...yeah a good external DAC is (IMO) probably the one component that will give you the biggest upgrade "wow factor" from a digital source. It was night/day when I added an Entech external DAC to my CD player years ago...just stayed up late listening to stuff/song details I'd never heard from system to that point. Much smaller incremental "wow" effect when I upgraded to current PS Audio DAC but makes you wonder what going to a real "high end" DAC might do for one's digitally sourced system...? Would love to A/B two systems with this premise: equal $'s spent on a DAC vs. the same amount spent on a phono preamp/high end TT/arm/cartridge setup. 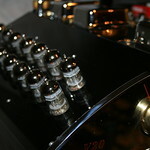 i.e., IF one had a $20K budget for example and spent that amount on either a DAC or on a phono preamp/high end TT/arm/cartridge analog sourced system, which would sound better?? PROBABLY the analog system, but no way to know for sure unless you heard both... In any case, enjoy your new Dragonfly DAC and I hope you can get a good power amp to go with it Real Soon Now!